By a series of astonishing coincidences Grange Park Opera is building a four-tier opera house at West Horsley Place, close to the A3 just beyond the M25, so within easy striking distance of many of our west-London-based customers. We think this development might well be of interest to you. I first came across Wasfi Kani when she was conducting at Garsington Opera in 1997. The following year we were then lucky enough to go to the ‘Figaro’ in the first season of Grange Park Opera which she started in Hampshire. The production, on a very shallow stage in the dilapidated orangery, with the audience on seats that had come from the Royal Opera House screwed to scaffolding, was a triumph of pizzazz and verve, with the singers exiting by jumping out of a window onto a mattress as the only way to get them off the stage quick enough. The audience applauded and stamped their feet in a snow of motes of paint and plaster that were not caught by the nets that were there to catch any dangerous lumps. Wasfi’s legendary fundraising then built the new theatre in Hampshire and the company flourished for eighteen years – until last year when the lease was ended. Undeterred, Wasfi seized an opportunity she had seen in the Daily Telegraph: that Bamber Gascoigne had unexpectedly inherited a 15th century house and 350 acres from his aunt, the Duchess of Roxburghe. There has been more fundraising and the new opera house opens in an utterly magical setting on June 8th with performances running to 15th July. Tickets start from £70 (or £35 if you are lucky enough to be under 35 years old). Book tickets here or call 01962 737373. All wines for sale at the Opera are from Lea & Sandeman, so as well as a fantastic performance in a beautiful setting, you are guaranteed a decent tipple too. 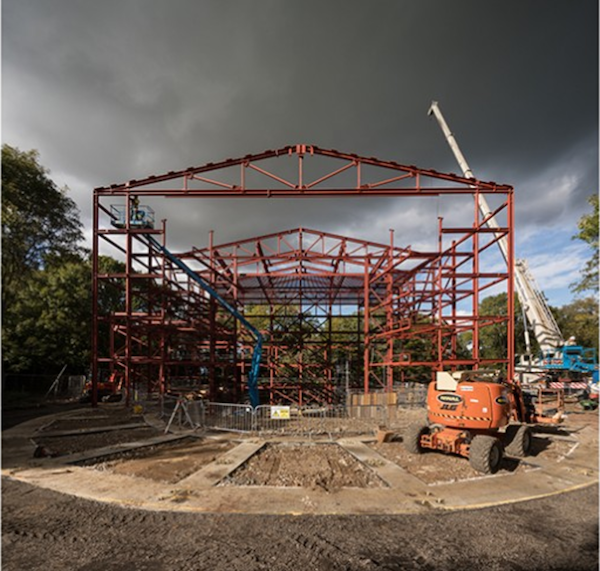 Watch a Time lapse video of the building of the Theatre in the Woods. Watch a video introduction to the new project and this year’s inaugural festival. Read all about it in the Telegraph’s recent article.